The doorway to Story, or a story depending on how you look at it. A “ghost sign” above the door to Story Coffee on St John’s Hill ensures that you know that you have arrived at the correct place. 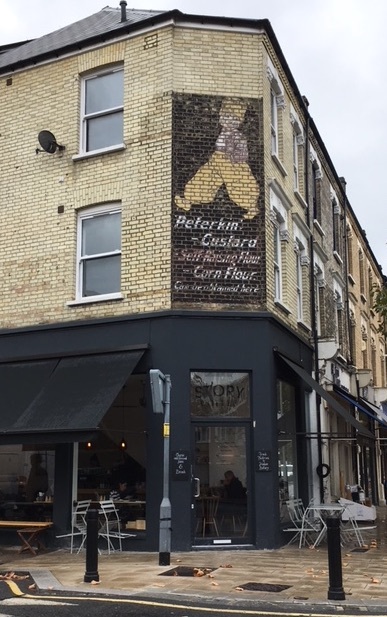 “Peterkin Custard, Self-Raising Flour – Corn Flour, can be obtained here”, only now it is coffee rather than custard that is sold in the shop beneath. The sign is an indicator to the many tales that could be discerned while exploring the coffee within. 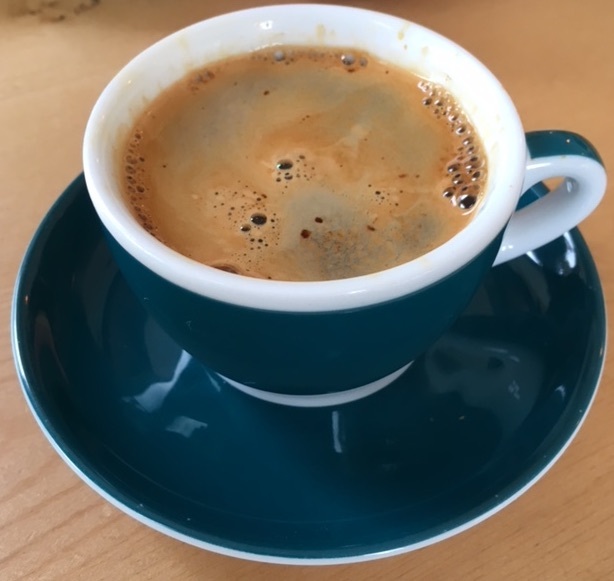 I had had a couple of attempts to visit Story Coffee (thwarted for a variety of reasons) before Brian’s Coffee Spot’s review appeared a couple of days after one of my attempted visits. Suitably re-motivated, another trip was attempted (address checked, closing times checked) and this time we were in luck. 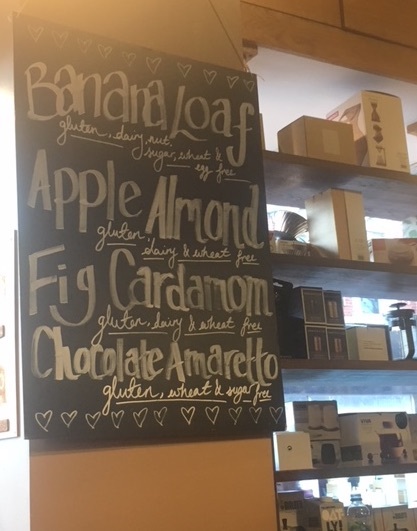 Although a pour over is listed on the menu, sadly this was not available on our visit and so I enjoyed a lovely long black instead (Red Brick, Square Mile) while looking at the cakes on offer. There was plenty of seating in which to shelter from the rain outside and many things to notice in this friendly café. In addition to the cakes and lunch menu, a box on the counter housed “eat grub” protein bars, protein bars made of cricket powder. Are insects the future for humans to eat protein sustainably? 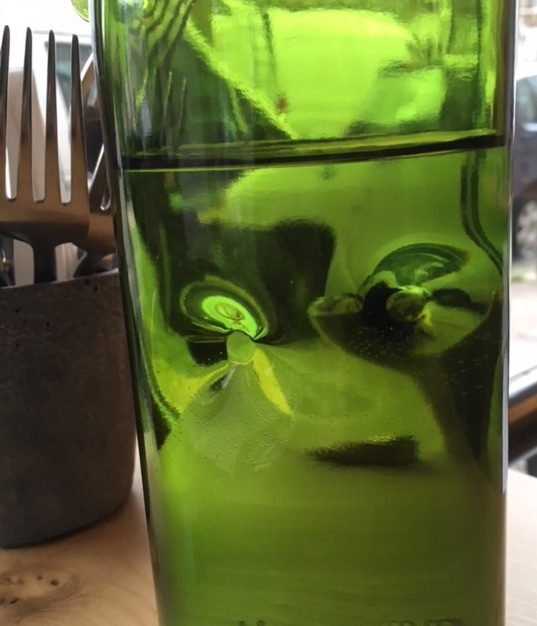 The distortions produced by the refractive indices of air, water and glass and the shape of the glass produces interesting effects on our view through it. The tables were well arranged for people to sit chatting while enjoying their beverages and it is always an excellent thing (from a personal point of view) to encounter a café with a no laptop (or tablet) at the tables policy. Complementary tap water was available in jugs placed on each table while it was also nice to note that Story branded re-usable cups were on sale from the counter. 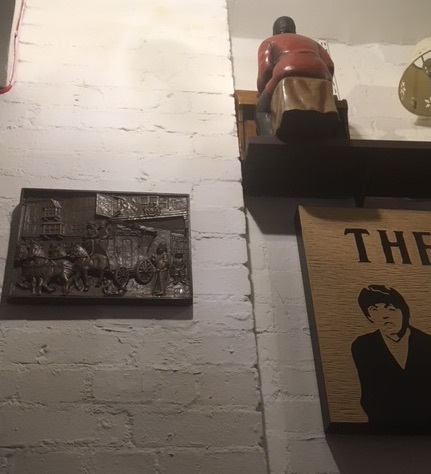 Many things we noted can be seen in the gallery pictures in the review on Brian’s Coffee Spot: the funky fans, the egg shaped light shades, the light introduced by the large glass window panes (though it was a much fairer day on Brian’s visit than on ours). 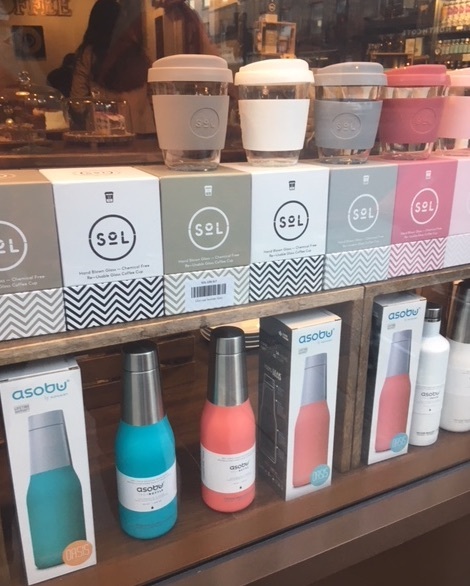 Each had its contribution to a thought train, the way the glass water jar bent the light coming through, the concept of a Prandtl boundary layer in fluids (and its connection to both fans and coffee cups). Moreover there were hexagons, which for someone who has worked on the periphery of the graphene craze, are always thought provoking. 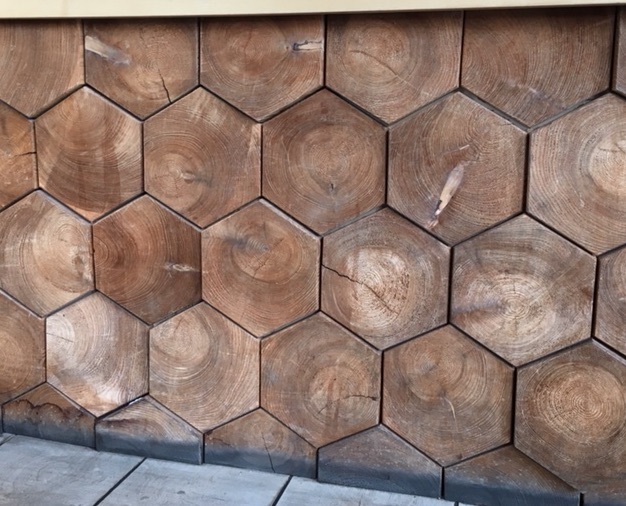 Apart from hexagons decorating the top of the stools, there were hexagons lining the counter made of cut logs, each showing the rings from the tree that was felled. Rather than a flat surface, these hexagons were made to be different thicknesses on the wall, rather like the hexagonal columns of the Giant’s Causeway. It is a subtle thing that may have implications for the space that is otherwise surrounded by flat, solid, walls. Such spaces can become echo-y and yet, the music and conversation in Story was not overly distracting presumably because features such as the uneven hexagonal wall reflected the sound waves such that they destructively interfered rather than echoed around the room. A macroscopic crystal of hexagonally cut logs forms the side of the counter. Each log in the hexagonal decoration was cut with its cross-section showing a number of tree rings. We know that we can age a tree by counting the rings (though each of these would be underestimated as they have been trimmed into hexagons post-drying), but what more do the tree rings, and the trees themselves have to tell us? The rings are caused by the rapid growth of large cells during spring followed by a slower growth of smaller cells as the year progresses. But this method of growth means that the cut logs have more to tell us than just their age. The spacing between the rings can tell of the weather the tree experienced during that year, were there many years of drought for example? Such clues, from the relative density of the tree rings, can help researchers learn about the climate in previous centuries, but conversely, reading the climate report in the rings can indicate in which year a tree was felled and so the age of a building for example. Many stories start with a coffee. And then there is more, trees will grow at an average rate per year so that, as a rough guide, the circumference of a mature (but not old) tree increases by 2.5cm per year¹. There is therefore something in the idea that you can have a good guess at how old a tree is by hugging it. But this assumes that the tree is growing in its optimum conditions, far enough from any neighbouring trees so as not to be crowded into growing more slowly. So the absolute density of tree rings must also give a clue as to whether this tree was in a dense forest or an open clearing. Which is reminiscent of something else that living trees can tell you if you listen to them closely enough: trees will grow so that their leaves are exposed to the maximum amount of light. For us in the UK, this means that the crown of a tree will frequently tip towards the south (where the Sun is most often) and there will be more leaf growth (and consequently more branches) in a southerly direction². But again, we only see this if the tree has room to grow on its own, without the crowding, and competition, of too many neighbours. A solitary tree helps us to know which direction we are walking in. 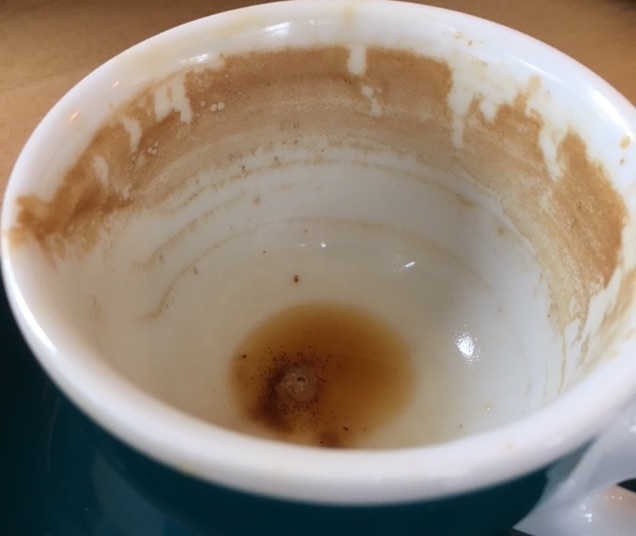 While many coffees could also tell a story. It depends on how you read them. Which all points to the idea that there are many stories being told all around us all of the time, the ones we hear depend on what we choose to pay attention to. So what about the story behind the ghost sign above the door? The Peterkin custard company was a venture by J. Arthur Rank in an attempt to start a milling company in the mould of his father’s (Rank Hovis McDougall, later bought by Premier Foods). The company failed and Rank went on to form the Rank Organisation that was responsible for many films made throughout the 40s and 50s as well as running a chain of cinemas around the UK. Truly a sign concealing many stories.